Mount Shasta is an important symbol of a relatively new religious movement in the last few decades - a New age, whose cults believe Mount Shasta one of the most sacred places in the world because it is a source of peace and harmony. It is also considered a gateway to space and entrance to the fifth dimension. According to the beliefs of the indigenous Indian population Mount Shasta was inhabited by a spirit, who is the King over all other spirits, and was called Skell. Mount Shasta was inhabited by the indigenous Indian population - the people that were Shasta, Modoc, Karuk, Wintu and other tribes. In the early twentieth century, Italian settlers managed to lay down the foundations of Catholicism. Besides Catholics in the area, there are Buddhists because in 1971 there was a Buddhist monastery (Shasta Abbey) founded. Fans of the ancient rituals of the indigenous local population to this day, practice these rituals in Mount Shasta. According to some legends in the mountains are hiding somewhere Lemurians and this was secretly a Lemurian village, which has even published scientific work. Even before BC, the north of Mount Shasta has always been inhabited by humans. In this part of the mountain have been made archaeological findings that testify to the housing of American Indians from about nine thousand years ago. Mount Shasta is located about sixty miles south of the border of California and Oregon. The mountain is higher than three thousand meters and geologically it is a strato- volcano with four cones. Mount Shasta is part of the Cascade Range in northern California and is considered one of the most beautiful mountains in the world. The word "Shasta" means pure, white, and probably comes from the first Russian settlers in California. The word is not associated with other nearby mountains. When the day is cloudless, the mountain can be seen from a distance of over one hundred and fifty miles. Mount Shasta is often a source of inspiration for many poets and writers from around the world. U.S. President Theodore Roosevelt was also fascinated by the magnificent view of Mount Shasta, which inspired him to say these words: "I think the twilight light of Mount Shasta is one of the most spectacular sights I have ever been witness to". Mount Shasta has seven glaciers, and four of them are Whitney, Bolam, Hotlum, and Wintun. They descend from over three thousand feet. Many climbers from around the world try to compete with Mount Shasta, which is mostly from April to October, but there are some brave men who climb in the winter. Some sections of climbing is risky, but it does not stop the enthusiasm of the climbers. Lovers of skiing love Mount Shasta. There are places for both experienced skiers and the laity in this area. Mount Shasta has erupted every eight hundred years, and during the last four thousand years this has happened every six hundred years. The last recorded eruption was noted two hundred years ago. Mount Shasta can not erupt with volcanic ash, but with lava. 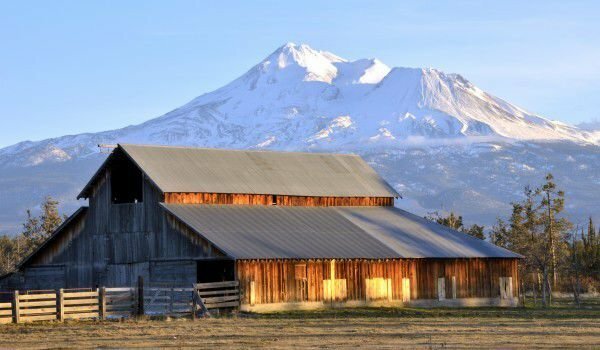 It is believed that Mount Shasta is a volcano that is now asleep, but will surely erupt again without being able to provide the exact date of the eruption, but most likely it will be after a long time - several hundred years.